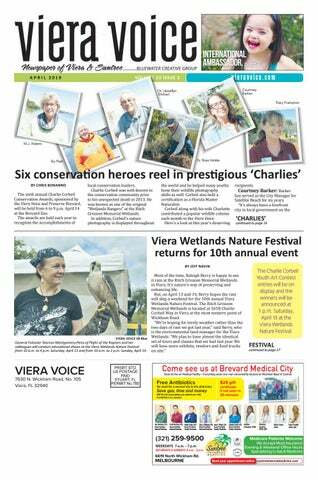 The Charlie Corbeil Youth Art Contest entries will be on display and the winners will be announced at 1 p.m. Saturday, April 13 at the Viera Wetlands Nature Festival. Save gas, time and money Will fill one prescription per patient per visit, if antibiotics are needed. (321) 259-9500 WEEKDAYS 7 a.m. - 7 p.m. SATURDAYS & SUNDAYS 8 a.m. - 2 p.m.
Money raised from the Armed Forces Day Rescue 5K and community fair will benefit Brevard County military families. Frederick Ho, MD, FACS Excellence in Ophthalmology since 1987 Board Certiﬁed in Ophthalmology Voted one of the top doctors and top Ophthalmologists in America. Juan Carlos de Rivero Vaccari, MD, PhD Specializes in cataract surgery, laser surgery, diabetic eye disease, macular degeneration, and glaucoma management. AN INTIMATE LUNCHEON TO HONOR THE GIVING SPIRIT OF WOMEN AND THE SPECIAL ROLES WE PLAY CARING FOR EACH OTHER AS WE CARE FOR OTHERS IN OUR LIVES. Motivational Humorist, Linda Larsen Her topic will be YOU! Superstar! Super Hero! Super Exhausted! She combines her 20-year experience as a professional actress with her education and training in communications and behavioral sciences to deliver entertaining, memorable, power packed presentations that will help you be the best YOU! Linda is the author of the best-selling audio program, 12 Steps to High Self-Esteem, and featured in such publications as Investor’s Business Daily, The Chicago Tribune and Opportunity World. A COPY OF THE OFFICIAL REGISTRATION AND FINANCIAL INFORMATION MAY BE OBTAINED FROM THE DIVISION OF CONSUMER SERVICES BY CALLING TOLL-FREE (800-435-7352) WITHIN THE STATE. REGISTRATION DOES NOT IMPLY ENDORSEMENT, APPROVAL, OR RECOMMENDATION BY THE STATE. SEE WWW.800HELPFLA.COM. REGISTRATION #: CH46905. WITH SPEAKER JA SEN K O BO BEL M . D . Come, speak with the first doctor to bring stem cell technology to Brevard and learn the important differences between FAT, bone and amniotic derived stem cells. DINNER BUFFET STARTS AT 5:30 P.M. Get educated on the scientific approach & learn about an alternative treatment to painful surgery. The patient has been diagnosed with osteoarthritis and chronic knee pain for years. “1 have been suffering with my knees for many years. The last two years I found I was walking less and less. The simple tasks were a burden. The pain was continuous. My husband studied about the stem cell procedure and we decided that this was what I was meant to try. Much prayers and consideration went into this decision. The results have been amazing. My mobility came as soon as the procedure was finished. I am walking without pain. My sleep is not interrupted for the first time in many years. Stem cell therapy has been the answer I was looking for! Thank you so much Dr. Kobobel!” —Delia B. Discover the Possibilities, Ask Questions... No Obligation! The entire contents of this newspaper are copyrighted by VIERA VOICE with all rights reserved. 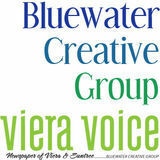 VIERA VOICE is not liable for errors or omissions in editorial, advertorial or advertising materials. Distribution of this newspaper does not constitute an endorsement of products or services herein. Reproduction or use without permission, of editorial or graphic content in any manner is prohibited. The giraffe sculpture is a hard one to miss at the Brevard Zoo. Let’s Talk! Start transforming your relationship today! Unsure if services are provided for what you are looking for? Then please call or email me for more information. Early morning and Saturday hours available. Office closed Mondays. Some of the most popular sculptures in the Brevard Zoo are the elephants. Proud Sponsor of the Space Coast Women Expo April 7 at the Melbourne Auditorium • 11 a.m. to 3 p.m.
Is it true that Varicose Veins are a sign of a medical issue? Yes. Please do not ignore signs of leg varicose veins. If you notice bulging veins, you have a significant medical condition. Bulging indicates a chronic medical condition. Constant dilation causes blood to stop blood flow back through the legs, leading to further damage. This includes swelling with tissue damage, legs swelling, aching legs, permanent skin pigmentation changes, along with ulcers. The diverging diamond interchange is nearing completion, which will connect the center of Viera to I-95. Team Peace Love Gianna participates in the 2018 Buddy Walk. Gianna Scauzillo, 5, has been named International Ambassador for Nothing Down. Graduated University of Pennsylvania School of Dental Medicine. Serving Brevard County since 2000. David Schillhammer started in January as the Brevard Symphony Orchestra’s new executive director. Morgan Woodard and her mother, Debbie Tweedie, have built the Viera High School swimming program from the ground up, creating a family atmosphere along the way. But after 13 years, Woodard has decided to step down as Viera’s coach to concentrate on her own family. “My boys are 1 and 4 now and very active, tons of energy,” Woodard said. “It’s just time to focus on family. “My mom always said when I was done, she was done. We just decided this was the time to focus on the kids. They’re only 1 and 4 once.” Woodard, 34, has built quite a program at Viera. Viera High School swimming coach Morgan Woodard, left, and her mother, Debbie Tweedie, stand in front of framed memories of their first season together. Woodard is stepping down after 13 seasons that have included more than 10 district championships, a Cape Coast Conference title, one regional championship and two CCC Coach of the Year awards. BASEBALL Home games played at USSSA Space Coast Stadium Games at 6 p.m. unless noted * District game April 1 – at Vero Beach, 6 p.m. April 2 – Astronaut (Senior Night) April 4 – at Melbourne, 7 p.m.* April 9 – Titusville April 11 – Harmony* April 16 – Merritt Island April 18 – Pinecrest April 23 – The First Academy, 7 p.m. April 25 – Heritage* April 30 – Cape Coast Conference playoff BOYS LACROSSE All games at 7 p.m. unless noted * District game April 2 – Satellite, TBA* April 4 – at Cocoa Beach* April 6 – IMG, 2 p.m. April 9 – Seminole, TBA April 10 – Lake Brantley April 12 – Montverde Academy April 16 – Class 1A, District 21 Semifinals, 5/7 p.m. April 19 – Class 1A, District 21 Championship Game, 6 p.m. April 26 – Class 1A Regional Quarterfinal, 7 p.m. April 30 – Class 1A Regional Semifinal, 7 p.m. GIRLS LACROSSE All games at 5:30 p.m. * District game April 2 – Satellite* April 4 – at Cocoa Beach* April 8 – at St. Edward’s April 10 – Lake Mary Prep April 15 – Class 1A, District Semifinals at Cocoa Beach, 5/7 April 17 – Class 1A, District Championship Game at Cocoa Beach, TBD April 25 – Class 1A Regional Quarterfinals, 7 p.m. April 29 – Class 1A Regional Semifinals, 7 p.m. SOFTBALL Home games played at USSSA Space Coast Stadium JV games at 5:15 p.m., varsity games at 7:15 p.m. unless noted * District game April 5 – at Cocoa, TBD April 13 – South Fork, TBD April 15 – Harmony* April 19 – Winter Springs (varsity only), 7 p.m. April 22 – Cape Coast Conference Playoff Game, TBD April 29 – Class 7A, District 6 Semifinals at Heritage, 6 p.m.
raising the bar this season. “We keep building. We keep growing,” Viera girls coach Nick Bigerton said. “The girls are playing outside of the season. They’re playing travel ball. They’re playing fall ball with me. “They just love the game. They’re continuing to work at it and they realize if they put the work and effort in, we are a good team.” The Hawks, who have won the past two district titles, are the clear favorite to make it three in a row thanks to the play of top scorers Micki Pippett, Grace Blythe and Brianna Staerk, plus the defense of Sammie Pippett and goalkeeper Tabby Caldwell. Viera also has benefited greatly from the addition of two experienced freshmen — Lexi Fischer and Lia Arbeeny — who already have had a big impact. “I think everything is pretty (much) the same (as last season), but I think we work better together,” Blythe said. Senior John Rahmes has played six years of lacrosse for the Tigers. He's using that experience to help teach some of the team's younger players. Experience that “AHA” moment. Have you ever experienced that “AHA” moment when everything felt just right? Let’s plan for your financial success so you can achieve that “AHA” moment! Call today for more information or to schedule a free consultation. TENNIS All matches at 4 p.m. * District match April 2 – Cape Coast Conference Playoff, TBD April 17-18 – Class 3A, District 13 Playoff at Fee Avenue Courts April 23-25 – Class 3A Regional Playoffs, TBD TRACK & FIELD April 16 – Class 3A, District 13 Meet at Sebastian River, 10 a.m. April 27 – Class 3A, Region 4 Tournament at South Fork, 8 a.m.
Nick Olomu is the No. 1 player on the Holy Trinity boys tennis team and is ranked 11th in junior tennis in the state of Florida. The Tigers are seeking another deep run in the state playoffs this season. BOYS LACROSSE * District game April 1 – Eau Gallie, 6:30 p.m. April 3 – at Merritt Island, 6 p.m. April 9 – Rockledge, 6:30 p.m. April 11 – Vero Beach, 6 p.m. April 15 – Class 1A, District 22 Tournament at Sebastian River, 5 p.m. April 17 – Class 1A, District 22 Tournament finals at Sebastian River, 7 p.m. April 26 – Class 1A Regional Quarterfinals, 7 p.m. April 30 – Class 1A Regional Semifinals, 7 p.m. GIRLS LACROSSE All games at 6 p.m. unless noted * District game April 5 – John Carroll (Senior Night) April 10 – at St. Edward’s April 15 – Class 1A, District 22 Tournament at Sebastian River, 5 p.m. April 17 – Class 1A, District 22 Tournament Finals at Sebastian River, 7 p.m. April 25 – Class 1A Regional Quarterfinal, 7 p.m. April 29 – Class 1A Regional Semifinal, 7 p.m.
we play West Orange.’ ” There is plenty of reason for the Hawks to be excited about the upcoming season, including the return of quarterback Bryce Norton. After leading the state in total yards (4,706) by throwing for 3,353 yards, running for 1,338 yards and accounting for 36 touchdowns, Norton was named the Class 7A Offensive Most Valuable Player by Florida High School Football. The best part about that for the Hawks is that he did all that as a sophomore. As dangerous as Norton already is, Smith said he would like to see the quarterback work on his drop-back passing game this spring. Viera is graduating two of the state’s top performing receivers in Sean Atkins and Shamaar Mohr, but there are a number of intriguing prospects looking to step into a bigger role. “I’m really excited to see what Jeremiah Housey does this year,” Smith said. “He’s establishing himself as one of the fastest kids in the county.” Housey, who has run 10.89 in the 100 meters during track season, will be joined by transfer Davis Mallinger and returners Caleb Osburn, Karsten Poole and Jarvelle Francis. Donovan Giles, a 6-foot-4 freshman who dominated at the JV level, will also get a chance to become a playmaker on varsity. Bryce Norton led the state in total yards (4,706) as a sophomore. He and the rest of the Viera Hawks will start getting ready for next season when spring practice begins April 22.
seeing what Justin Humphries and Tyler Matas — who mauled defenders on the JV level — can do on varsity. Two of the biggest question marks going into the season will be in the secondary and at linebacker. Zak Sedaros is expected to anchor the secondary along with Kato Holmes, Mallinger, Jeremiah Housey and Bryce Reynolds. Interested? Learn more! Take a tour, join a resident host to play golf or tennis, dine in the At Ease Club, & tour the community! 2-4 BR Single Family Homes Extensive Maintenance Program Private Par 72 Golf Course Your first year of golf is included with home purchase; free golf lessons with Pro. Twitter account in late February that he had committed to West Florida. Then there’s quarterback Dru Nickson, who signed to play basketball at Embry-Riddle University, but was selected as honorable mention all-state by Florida High School Football. “A lot of production has to be replaced, but it has to be viewed as an opportunity for other guys,” Hooks said. The Tigers will certainly have some talent coming back in running back Larry Hill and wide receiver James BlackStrain, who have each received multiple Division I scholarship offers. Benji Nicks and Rico Frazier are ready to step in at the defensive end spots. Trey Palmer, who has played cornerback and linebacker, has an offer from Cornell. Holy Trinity is also expecting to get a big contribution at running back from transfer Kevin Chandler. Of course, the big excitement around the Holy Trinity program came when Hooks announced on Twitter that the school will build a new $5.5 million facility and turf field. SOFTBALL * District game April 1 – Cocoa Beach, 5:30 p.m.* April 2 – Cocoa, 5:30 p.m.* April 4 – at Satellite, 6 p.m.* April 8 – Astronaut, 5:30 p.m.* April 9 – at Eau Gallie, 6 p.m. April 11 – Titusville, 5:30 p.m.* April 16 – Astronaut, 5:30 p.m.* April 17 – Space Coast, 5:30 p.m.* April 25 – at Palm Bay, 6 p.m. April 26 – at Sebastian River, 6 p.m.
Holy Trinity wide receiver James BlackStrain, center, has multiple scholarship offers. The Tigers open spring practice April 22.
program is focused on reproduction, population biology, ecologic geography, and conservation biology of marine turtles.” Ehrhart says he is perhaps most proud of the work he and his students conducted in the 1980s helping to establish the Archie Carr Wildlife Refuge that is located in southern coastal Brevard. Ehrhart also discussed being named a recipient adding that, "I was really honored because I regard it as coming from the Brevard conservation community as a whole for which I have incredible admiration." Charlie Corbeil, who died in 2013, was known as one of the original Wetlands Rangers at the Ritch Grissom Memorial Wetlands. to let them know that we can help, but also that we can use donations. (We’re) really trying to get our visibility improved in the community," Frampton said. Although she said she misses field work after past professional experience that included stints as a zookeeper and has included a trip to Africa to study birds for three months, Frampton is thrilled that she’s able to make a difference in her current role. “I feel like I am making a difference being in the position that I am because I am able to build relationships with other organizations," Frampton said. professor emeritus at UCF. "I think the thing that I'm really most proud of was the work that I've done with the Endangered Lands Program, serving on the selection and lands committee,” Hinkle said. “That, in my opinion, is kind of the highlight of my career.” Hinkle, who also worked for 25 years at Kennedy Space Center on work relating to life sciences, seemed delighted to be named as an award recipient. "I was honored to be honest with you because I've known other people that have won the award. I feel it's an honor to share that this type of award with people like that." Students in the Future Leaders of Manatee club at Manatee Elementary School show off their donated shoes. CAN A SUMMER MAKE A DIFFERENCE? Price includes all activities, meals and field trips. 2019 Innovation Games challenges talented students BY AUSTIN RUSHNELL One of the greatest sources of creative invention isn’t actually some stuffy boardroom in a think-tank — it’s inside the young and vigorous minds of today’s STEAM-driven school children. STEAM stands for Science, Technology, Engineering, the Arts and Mathematics. It is the core focus of many of Brevard’s schools. Brevard Public Schools recently partnered with technology leaders, including Boeing and NASA, to host the inaugural Innovation Games. The Innovation Games are a series of competitions held for schools around Brevard in which they compete in STEAM-focused challenges. The teams were made up of sixth-grade students from both standard and magnet schools, public and private. Gemini Elementary School students Maximus Carl, left, Gabriella D’Elia, center, and Riley Dwyer, second from right, show off their tie-dye lab coats with teachers Caryn Good and Rodger Cohen during Day 1 of the Innovation Games. 6, 2019 at 8 p.m.
Students were able to interact with representatives from companies such as Northrop Grumman during the 2019 Innovation Games. 1715 Berglund Lane • Suite B Southeast side of Murrell & Viera Blvd. Located in Suntree Square 7777 N. Wickham Rd. May 6:30 p. 21, 2016 m.
Eagle Scout Ryan Jarvis stands next to his collection receptacle in the Government Center of Viera. A Cup of Joe with GO at Suntree Tuesdays, 9 - 10:30 a.m.
Disclaimer: Prices are per person, based on double occupancy, cruise only and include all current fees and taxes Ships registry the Bahamas. Brevard County Sheriff’s Cpl. Mark Spencer plays basketball with Sammy Chaffiot of Rockledge. Michelle Salyer, the school’s communications and marketing manager. As a result, Holy Trinity signed an agreement with the BCSO and Sheriff Wayne Ivey to provide a deputy sheriff to work fulltime as a school resource officer at Holy Trinity’s Upper School. are locked, monitoring the school’s visitors badging system and numerous cameras, advising school officials about safety upgrades and holding safety classes for juniors and seniors. Hot Tubs for Every Family and Budget are Deeply Discounted for Savings that Won’t Last! really smart, obviously. They are quiet, really studious, but not the type of person you would think would be really confident in an academic competition. “They worked so hard. They trusted each other. They’re all friends. And they just crushed the competition.” Viera’s A Team, which consisted of Morgan Bentley, Mason Watts, Zack Chace, Maggie Zendehrouh and Zach Hafele, took seventh place in the competition. The championship matchup was an all-Brevard County showdown between Viera and Eau Gallie. Viera High School's ocean science academic team recently competed in the 2019 Florida Manatee Bowl with the B Team winning a title for Viera for the third straight year. Students were tested on their knowledge of ocean-related topics, which included cross-disciplines of biology, chemistry, policy, physics and geology. Eliminate Hard Water in your Home! Eliminate High Cost of Bottled Water and Environmental Plastic Bottle Usage! • Drinking Water Systems • Chloramine Guard • Softeners, Filters • Well Water Systems • No More Smelly Water! Read reviews and patient testimonials on Google! Mon., Tues., Thurs., Fri. 8 a.m. to 5 p.m.
Home2 Suites by Hilton will be an all-suite, extended-stay hotel. All rooms will include a kitchenette. MaxLifeTM - Specially Formulated to meet the needs of cars as they age past 75,000 miles. Includes new filter up to 6 qts of 5W30 (0W20 or 5W30 for MaxLifeTM or Full Synthetic) Valvoline Oil, check air filter, lubricate chassis & door hinges, check all fluids, check tire pressure. Plus $3 disposal fee. Most cars. Must present coupon. Expires 4/30/19. 7200 Dolina Ct. I Suntree/Viera 1/2 mile east of I-95 on Wickham Rd. New businesses give Suntree, Viera residents more choices BY AUSTIN RUSHNELL A common saying in medical services is that prevention is the best medicine, and detection is a vital aspect of prevention. A new business in the Suntree area is Space Coast Thermography, which offers non-invasive, radiation-free thermographic imaging services. “Space Coast Thermography provides the most technologically advanced medical thermal imaging system available in Brevard County,” Space Coast Thermography officials stated. “Thermography is an excellent preventative health screening tool, for both women and men, for the adjunctive detection and monitoring of breast disease, vascular health, stroke, diabetes, back and neck pain, carpal tunnel syndrome, thyroid health, dental challenges, fibromyalgia, and more.” Space Coast Thermography is the sole provider of thermographic services in Brevard County, and offers high-resolution camera systems. “Thermography is a radiation-free and compression-free thermal imaging procedure,” said Owner Kristen Barry, Ph.D., CTT. “(The procedure) causes no threat or harm to patients and can indicate if there are changes which could lead to breast cancer years before other imaging tools.” Space Coast Thermography is located at 7125 Turner Road, Suite #101 in Rockledge. For more information, go to spacecoastthermography. com or call 321-574-9014. The Space Coast Thermography team, Dr. Kristen Barry and her husband Chris, offers non-invasive, thermographic imaging services for patients in Brevard County. Indian restaurant. It’s going to be more of lighter colors, (i.e.,) light blue with a white background, all the plating will be copper plates; (we’re) trying to bring a touch of India, however also having a Western interest in mind.” Taj Indian Cuisine is looking to host its Grand Opening in two months at The Avenue Viera. Club Pilates offers low-impact, full-body workouts at its new facility in Viera. “Anything that can go wrong will go wrong” unless you plan... you need an ESTATE PLAN! $ with mention of this ad. Got Ugly Concrete? We can transform your old, cracked Driveway, Pool Deck, Lanai, Patio, Garage or Walkway into a beautiful work of art. Beef ‘O’Brady’s of Viera will reopen its doors following new, statewide renovations to its restaurants. Summer Lakes - $1,050,000 (Price Reduced) 5 bedrooms + Office, 4.2 Baths, 3 car – Stunning Luxury Custom Estate Home on .81 Acres of Spectacular Property Landscaped w/ Majestic Oaks overlooks a 68-Acre Lake Bibilia in Viera’s Prestigious Gated Community. Chelford - $509,900 5 bedroom, 4.5 bath, 3 car garage with Beautiful Lake & Pool Views! Heritage Isle Villa - $224,900 2 Bedroom plus Den/Office, 2 Bath Built 2013 like-new! $1,000 credit for Clubhouse Fee! 2 Bedroom, 2 Bath - Exceptional River & Pool views from 7th floor furnished Cocoa Village condo. Boaters Delight with new Marina & Boat Slip. NOW is the BEST TIME in REAL ESTATE.... NEW CONSTRUCTION or RESALE!!! • AppleCare+ Sales & Service • Apple Certified Technicians on staff at all locations • Warranty and out of warranty repairs on all Apple products • Sales and after sales support on Apple products. Apple, the Apple logo, Mac, iPhone, and iPad are trademarks of Apple Inc,. Registered in the U.S. and other countries. Space Coast Classic adds south Viera to its course layout BY CHRIS BONANNO The 33rd annual Space Coast Classic 15K & 2 Mile will be held April 14 with both runs beginning and ending at Quest Elementary. The 15K will begin at 6:45 a.m. and the 2 Mile will start at 7 a.m.
on-site,in factory certified service  Full-time,Come and try a Baby Lockengineer Serger! We try our best to ‘under-promise and over deliver’ Check out the Q&L website for class schedule and events. Details coming soon on quilting/ VIERA VOICE Courtesy of Power of Pizza Charities 7720 Wickham Rd.  WeN. are an authorized, full line retailer for Baby , 32nd annual Space Coast Classic 15K get off to a fast start in the challenging event. RunnersLock® in last year's embroidery cruise in October. Insights On Eyesight Our Vision is your Vision for 2020 and beyond. The Ritch Grissom Memorial Wetlands in Viera is a quiet and solitary place to enjoy some of Brevard County's wildlife. • Dr. Daniel King and Dawn Trundle, ARNP-C provide experienced care and judgment utilizing optimal materials and techniques. • We specialize in operative and non-operative care of the painful knee, hip and shoulder. • The anterior technique offered for most hip replacements may result in less pain, and a quicker recovery. Solution on page 38 ACROSS 1. "Formerly," formerly 5. *Steven Tyler to Liv 8. *"Ebony ____ Ivory" 11. Shakespeare king 12. Depression drifter 13. *One with lonely heart 15. Epiphany guests 16. Sir Mix-____-____ 17. *"Free Fallin" performer 18. *"This is what it sounds like when ____ ____" 20. Day before, pl. 21. Scandinavian fjord, e.g. We have several openings for "Little Mozart" students, ages 4-6 Other openings are available with several of our highly qualified teachers. Please call to find the available time slots. Are you suffering from chronic knee pain, shoulder pain, hip pain, elbow pain, wrist pain or ankle pain due to arthritis and/or inflammation? Have you been told the only thing that will help is surgery? Come hear about this exciting new therapy and how it has helped thousands who are suffering from chronic pain and arthritic joints! Samara Z., 66 years old “Within 24 hours, my pain level in my knee went from an 8 to a 2! After just three weeks, sometimes my pain level is a 1 and sometimes I forget there’s an injury there. The arthritis in my hands is not waking me up in the mornings anymore. It’s been wonderful! “Back in November, I asked my doctor for a handicap parking tag because I could not shop because of the pain in my hip and shoulder. But, since I went to Peak Performance and received Stem Cell Therapy, I am no longer parking in handicap spots. I am now pain free! Wetlands Nature Festival Tea Party & Fashion Show Viera 10 a.m. - 4 p.m.
Church volunteers and guests participate in a chair exercise class. Quality legal services with a Compassionate Touch for you and your family Let me help you navigate the complex legal world of aging including Estate and Incapacity planning, Probate, Guardianship, Long Term Care planning, Medicaid and VA Aid and Attendance. 321-253-1667 • FloridaElderLaw.net Free Initial Consultation! We are listing and selling homes in ALL price ranges! Contact our Team today for information on flexible commissions and comprehensive marketing plans. Visit our new offices on US 1 in the Space Coast Business Realty Center (SCBRC). Come dine with us and enjoy fresh dishes made with ingredients imported from Greece. This is gourmet quality food in a fast casual setting! Originally from New York we are family owned and operated since 1980.
the purchase of $30 or more Dine In, Dinner & food only. To view the video of the Boomer Guide Senior Expo, go to Facebook/SeniorLife. The popular Boomer Guide Senior Expo, held at the Space Coast Convention Center in Cocoa, featured live music, vendors, exhibits and an opportunity to meet the 2019 Boomer Guide models, shown here with Lanakila’s troupe of Polynesian dancers. what’s going on, things to do and places to visit in Brevard County. “We had a full house and we got a lot of wonderful compliments,” said Bluewater Creative Group CEO Jill Blue. “The exhibitors and attendees had a wonderful day. The band and dancers were awesome. Many of the vendors said it was the best expo we’ve ever put on.” One of the highlights of this year’s expo was the live entertainment provided by Lanakila’s troupe of Polynesian dancers. “We take people on a musical journey to Polynesia,” said Nathan Pokipala, who started Lanakila’s 29 years ago. Find everything you need to live your best life on the Space Coast, from clubs to activities, to health care, recreation, the best places to live and everything in between. For a pick-up location near you, or bulk delivery of 30 or more guides, call 321-242-1235. DISCOUNTS & COUPONS Randy’s Pressure Washing The Hurri“cano” Solution to your pressure cleaning need. Restrictions Apply. Cannot be combined with any other offer. Why wait another day to have a beautiful smile? www.ValderramaOrtho.com New patients only. Offers may not be combined. Offers have no cash value. Fees may be charged for copies of x-rays. Fee advertised is minimum fee only. Promotion will remain available for 30 days following the final advertisement for the service. THE PATIENT AND ANY OTHER PERSON RESPONSIBLE FOR PAYMENT HAS THE RIGHT TO REFUSE TO PAY, CANCEL PAYMENT, OR BE REIMBURSED FOR PAYMENT FOR ANY OTHER SERVICE, EXAMINATION, OR TREATMENT THAT IS PERFORMED AS A RESULT OF AND WITHIN 72 HOURS OF RESPONDING TO THE ADVERTISEMENTS FOR FREE, DISCOUNTED FEE, OR REDUCED FEE SERVICE, EXAMINATION OR TREATMENT. ADA*S D8090, D8080, D8070. FL Lic DN 19651@2019 Valderrama Orthodontics All rights reserved. Make your immunization make a world of difference. Shingles, pneumonia, and more available now! Love Your Campus makes strides ahead of Earth Month From Feb. 1 to March 1, Merritt Island High School (MIHS) participated in a campaign to Reduce Litter, Reuse Bottles and Recycle Better. The campaign, born from the initiative of environmental science and biology teacher Teresa Nick and developed by Recycle Brevard, aimed to improve campus practice of the 3Rs. to receive prizes such as reusable straws generously donated by a local business, Softer Sip (softersip.com). Besides learning about recycling, students participated in a campus cleanup and tracked the number of water bottles saved by using the bottle filling stations at MIHS. The results? inevitable part of the process of making a lifelong change. People are often unwilling or resistant to change during the early stages, but they eventually develop a proactive and committed approach to changing a behavior.” That model only confirms what we knew before we started. It will take time and a lot of practice to get everyone to recycle better. Awareness is just the start; small and gradual improvement is what we should look for. So, I am proud of MIHS for taking the first step into this journey. In order to achieve long-lasting change, one needs to keep at it. The power also is in numbers and getting more individuals — not only students, but staff and teachers as well — involved and committed to the process. That will be a key for MIHS to continue on the path of improvement. Love Your Campus started a process at MIHS that Recycle Brevard would like to help all schools in Brevard County to begin. After all, for a community to change, the whole community must get involved. The more schools we help, the higher the chance we have in making a difference in our community. Lucky’s Market in Melbourne wants to support that effort through its Impact Days program that will donate 10 percent of its sales on April 23 to Recycle Brevard. During this Earth Month, consider investing in a better community by shopping for groceries at Lucky’s on April 23. Recycle Brevard volunteers sincerely appreciate your support. Happy Earth Day! VV Email Marcia Booth at Marcia@RecycleBrevard.org. *Contact your Vacation Consultant for full terms and conditions. • Thyroid • Sick/Urgent Visits, etc. MOST MAJOR INSURANCES ACCEPTED NO INSURANCE, NO PROBLEM Ask for our Discounted Prompt Self-pay Rates! ACCEPTING NEW PATIENTS OUR MISSION To provide quality care during health and sickness. We are proud to be able to 18 and Older take care of our patients during hospitalization SAME DAY / NEXT DAY and follow them in rehab or outpatient in our APPOINTMENTS office. Buy directly from the manufacturer. Please visit our factory. Free Estimates! Avoid the rush, order early. Why take 8 hours to do a 30 minute job? To always conduct oneself with honesty and fairness. was labeled “La Florida” (land of flowers) by Ponce de Leon. Some historians claim the name was derived from “Pascua Florida” (feast of flowers) — the Easter season when the Spaniard discovered the peninsula which he believed was an island. Disembarkment was probably in St. Augustine or Melbourne Beach. This explorer also is famous for his Fountain of Youth quest, seemingly a tale. Still, hope remains for eternal youth in stem-cell research or simply smelling the flowers. Certainly, the sweetest smelling flower in the spring in Central and South Florida is the white orange blossom nestled in a cluster. This is our state flower. Since the orange tree might flower and bear fruit simultaneously, the blossom is associated with fertility. Gypsy Vanner Horses first came to the USA in 1996. These horses resemble Clydesdales but are a breed of their own. We will take a tour and have interaction with the horses. Followed my marvelous lunch at the Mission Inn. Sign up by April 19th. Minimum of 35 needed for trip. Join Jean as she escorts out her annual river cruise exploring new areas this year. 6 spots available. Enjoy Our Camps! Enjoy Your Summer! Trip includes 3nights accommodations, Ask breakfast daily, 2the lunches 1 dinner. This me about new and Celebrity Edge! years included activity is Sunset Catamaran livehas music, and (This is theSail firstwith ship that wowedhor med’uerves in over 10 years! cocktails. Only 12 seats left available. $561 person based double occupancy She isper elegant and full of new,on exciting offerings on board.) My rates are lower than current advertised rates on MSC Seaside January certain sailings.4-11, This is an 2020 experience not to be missed! We c,will to&Ocho Rios,departing Grand March Cayman, and their private island of pacifi Suezsail Canal Galapagos) 1, 2019Cozumel – April 30th, 2021. Perksnew include beverage package Ocean free Caygratuities, Marineonboard Resort. 1stand busunlimited sold out, now WiFi. selling 2nd bus. (excluding gratuities), credit, high speed Suites receive all four perks. Call today to take advantage of our great rates! The community newspaper of Viera and Suntree, Florida.